For long, Baisakh has become a cruel month for parents who want to admit their children in schools for new academic session. Monthly and admission fees scare them off. 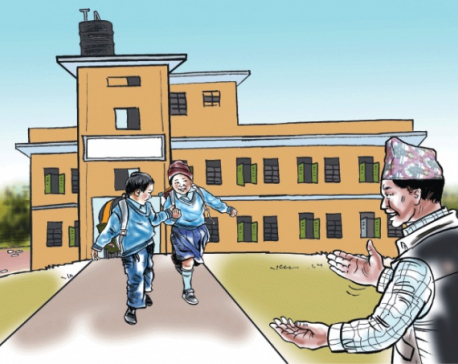 Some schools in Kathmandu and out of the valley are charging exorbitantly high amount—as much as Rs 40,000 per month in monthly fees. And this is happening under the nose of the government that loves to brand itself as ‘socialist.’ Ever increasing fee structure has hit the middle-income and low-income parents hard. Our education system has created such divide between public and private schools that parents cannot choose to switch to public school system for they know that these schools—largely due to political meddling and utter disregard of the political class to improving education quality and infrastructure—are in mess. Private schools are the choice for many parents but they are becoming increasingly unaffordable. Even more worrying is that local governments are not doing anything to improve this situation. Fee rise in private schools in Parbat is a case in point. Private schools there have decided to increase fees by 25 percent without consulting with District Education Office (DEO) and the guardians. Only 11 of the total 43 private schools have submitted the details of the proposed fee structure to the DEO. Others have gone about it arbitrarily. This is against the educational policy of the country which mandates that DEO by consulting with Central Committee of Fee Management and Inspection should publicize the maximum fees that can be charged by the schools for various grades and such notice must be published three months before the start of new academic year. Also it is mandatory to consult the members of Teacher-Parents Association before increasing the fees. Private schools in the district have not done so. But district authority has done nothing to check the anomalies. Besides, these schools have also made it compulsory for the students to purchase books, stationery materials and uniforms from the schools. This is the trend across the country and it must be checked without further delay. What Kathmandu Metropolitan City did could be emulated elsewhere and strictly enforced. KMC has fixed maximum fee private schools operating under its jurisdiction can charge students for the new academic session. It has classified schools under A, B, C and D categories and fixed fee ceilings for schools of each category. As per KMC’s rule, category D schools cannot charge more than Rs 1630 (category C, B and A cannot charge more than Rs 2,024, Rs 2,418 and Rs 2,812 respectively) for students of Grade I to V. The students from Grade VI to VIII should not be charged more than Rs 1901, Rs 2351, Rs 2801 and Rs 3251 by category D, C, B and A schools respectively. This seems to be a fair ruling but as things stand private schools in Kathmandu charge much more than this amount. Unless stringent measures are taken to punish those who violate this fee structure, this rule might remain limited to paper. Every new academic session, fee rise in private schools becomes a matter of debate. Student unions, guardians’ associations and media raise the voice and the government also promises to check the anomalies but soon the whole issue is forgotten. At the end of the day, the parents are left with no option but to pay whatever amount is imposed on them by the schools. This must come to an end. On their part, private schools should make affordability of parents major determinant while fixing fee structure.